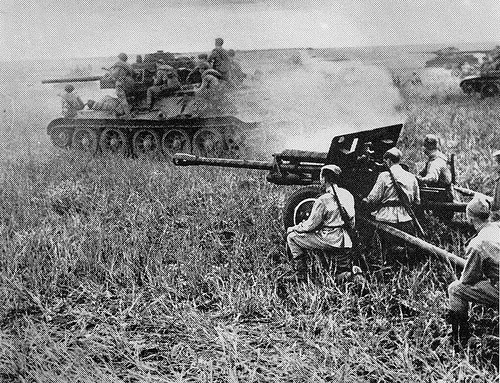 The Battle of Kursk (July 4 - July 20, 1943) was a decisive battle on the Eastern Front during World War II. The battle was an attempt by the German side to get on the offensive after defeat in the Battle of Stalingrad. The Soviet counterpart, however, had good intelligence about the German preparations. 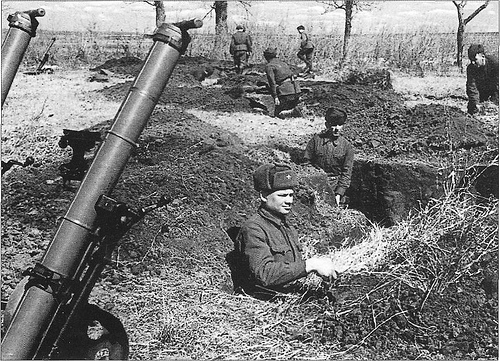 , the Red Army established deep defensive positions and gathered large forces in reserve. The Battle of Kursk was one of the greatest armored battles and probably the air battle in history that led to the largest loss in a single day. The famous tank crew at Prokhorovka was part of the Battle of Kursk. The German forces were unable to break through the Soviet lines, and eventually brought the Soviet forces counterattacked. 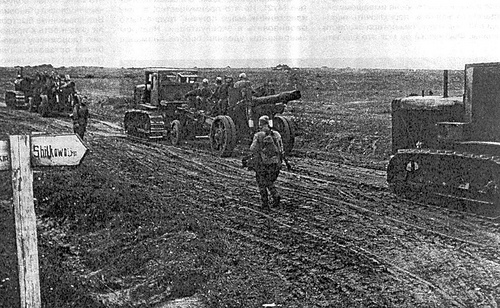 The German side named the battle as "Operation Citadel", while the Soviet side, had two names for it: "Operation Kutuzov" for the defensive and "Operation Polkovodets Rumjantsev" for the offensive. The Battle of Kursk was the last major German offensive on the Eastern Front, after Kursk the initiative shifted to the Red Army. The Soviet battle plan and its execution was exemplary and is still a subject of study in war schools. 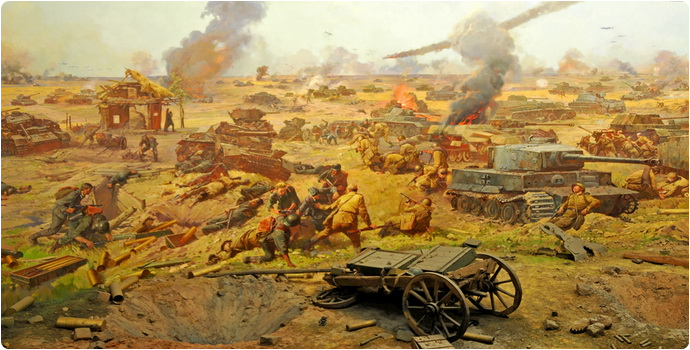 The Battle of Kursk, which took place 60 years ago, was a direct continuation of the Battle of Stalingrad. After the Paulus army was successfully encircled, the Soviet command made a serious mistake and failed to surround and eliminate the entire Nazi force on the Don and in the North Caucasus. Field Marshal Manstein, who had been allowed to get away from the Caucasus, in February-March 1943 inflicted a crushing defeat on Soviet forces, retaking Kharkov and Belgorod. The Nazis did not have enough firepower for Kursk, hence the Kursk Bulge, a projection going deep into the Nazi front. Within that bulge a powerful Soviet force was concentrated, and the Nazis were out to get the Soviets in revenge for Stalingrad by encircling and routing them. After June 1941, the Nazis did not prepare any other offensive operation as thoroughly as they did Operation Citadel. Preparations continued for almost four months; the troops received a substantial amount of modern hardware and equipment, including Tiger and Panther tanks, Elephant (Ferdinand in Soviet terminology) self-propelled guns, Fw-190 fighters, the AT modification of the Ju-87 bomber, and so forth. Preparations were made amid the utmost secrecy, but that secret was known to everyone. The axis of the upcoming Nazi strike was far too obvious. Soviet intelligence services merely confirmed the Nazi plans. So Soviet troops prepared the counteroffensive operation just as thoroughly. Never in the entire Great Patriotic War had our army built such strong, deeply layered defensive installations. And, whereas virtually all Nazi attacks in the 1941-1942 period came as a surprise to us, this one was awaited impatiently (if this term is at all applicable to a relentless battle). Furthermore, it is a military-science axiom that an attacking force should have at least a four-fold superiority over a defending force. At Kursk, in the summer of 1943, the Nazis did not have any superiority at all. The Soviet Central and Voronezh Fronts had a 20 percent to 50 percent superiority over the opposing Center and South Groups while there was also a whole reserve front - the Steppe Front, making Soviet superiority over the Nazis more than twofold. To cap it all, we knew exactly when the Nazi offensive was to begin. In such conditions, Operation Citadel was a suicide mission for the Nazis, pure and simple. It is noteworthy that Hitler was well aware of that, but the Nazi generals were resolved to take their revenge for the Stalingrad humiliation. The offensive began on July 5. Strange as that may be, the strike by the group under Manstein's command, in the south, proved successful. In less than a week, an armored fist of Tigers, Panthers, and Elephants, escorted by AT Junkers, despite fierce resistance by Soviet forces, breached all three defense lines of the Voronezh Front commanded by Gen. Vatutin. By July 12, the Nazis gained operational depth, and so to rectify the situation, which was getting catastrophic, the Soviet command mounted a counterstroke with the assets and forces of the Fifth Guards Tank Army under Gen. Rotmistrov. 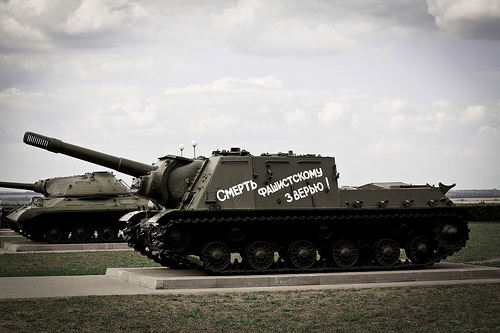 That was the historic battle of Prokhorovka. It consisted of a number of separate combat episodes, the total number of Soviet tanks reaching 660 with the Nazis having not more than 420. So Prokhorovka cannot be regarded as the largest tank battle in war history: Even in the course of the Battle of Kursk there were more wide-ranging engagements, while in late June 1941 over 1,500 tanks on both sides had been involved in a battle in Western Ukraine. 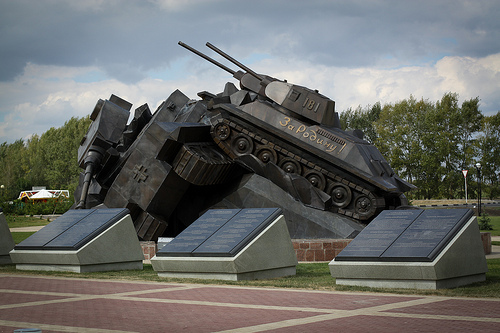 As for the losses, the fact is that the Soviet side lost approximately 500 vehicles while the Nazis, about 200. 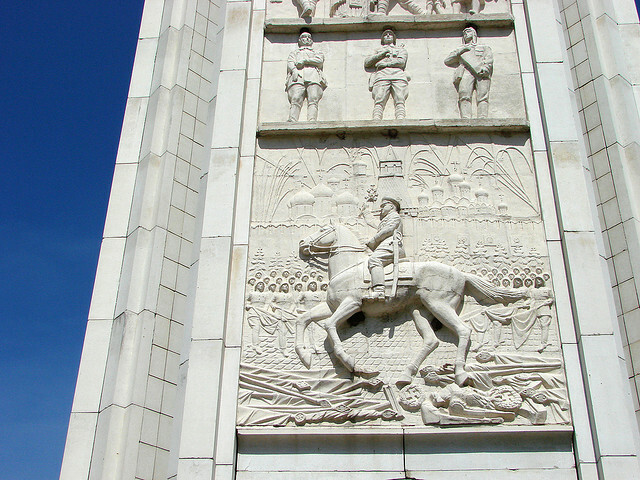 Therefore it is difficult to talk about victory here although that was very well understood at the time. 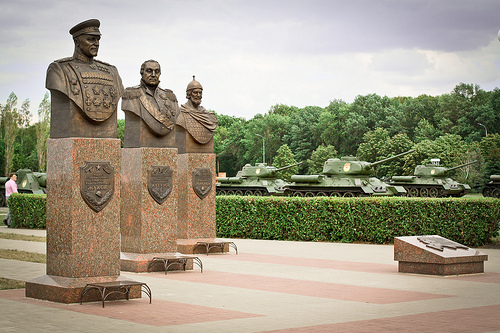 As Rotmistrov himself recalled later, "when he learned about our losses, Stalin flew into a rage: After all, according to the Supreme High Command plans, the tank army was designed to take part in a counteroffensive, near Kharkov, but now it had to be reconstituted and reinforced. The supreme commander decided to dismiss me from command and all but have me court-martialed." To analyze thebattle of Prokhorovka, Stalin gave orders to set up a State Defense Committee commission, which judged the operation a classic failure. Manstein's victory, however, proved hollow. First, Nazi losses were enormous even though smaller than Soviet losses. There were no assets left to exploit the success. Second, Gen. Model, who attacked the Kursk Bulge from the north, moving toward Manstein, got hopelessly stuck in the defense lines of the Central Front commanded by Gen. Rokossovsky. Furthermore, on July 12, he was attacked from the rear, when Soviet Western Front troops began an advance on Orel. 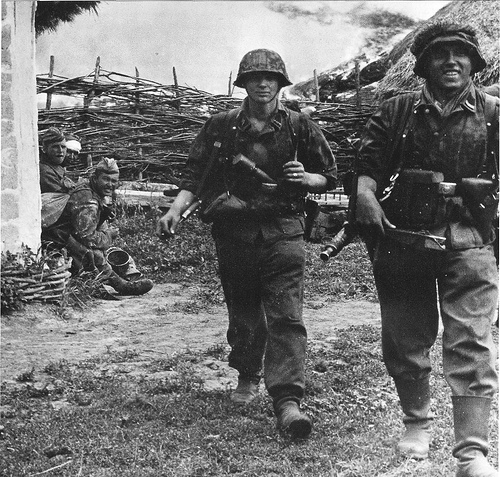 Finally, British-U.S. troops landed on Sicily, and Hitler panicked. The subsequent course of the war showed that the allies did not have a chance on the Italian Front, but in July 1943, Hitler ordered troops to be redeployed from the Eastern Front to Italy. By July 17, Manstein began to retreat. The Nazis "achieved a defeat," showing that they were still superior fighters while the Soviets "suffered a victory" since the battle had from the start been hopeless for the Nazis. Everything could have been different at Kursk had the Nazis attacked not at the base of the bulge, where Soviet forces were expecting them, but head-on, where there were virtually no defensive lines. In that case they would have reached the rear service positions of both the Central and the Voronezh Front on the second day of the operation. That was what Manstein wanted to do, and Marshal Zhukov recognized the danger after the war. Hitler was also inclined to support that plan. But being products of the classical Prussian military school, Wehrmacht generals refused to break canons. They did everything "properly." And lost. After that, the Nazis, having lost their elite units, were unable to attack successfully until the end of the war while the Soviets took another step to victory, once again paying an exorbitant price for that.